The shadow side of yellow is a demonstration and painting done last night for my Wednesday class. 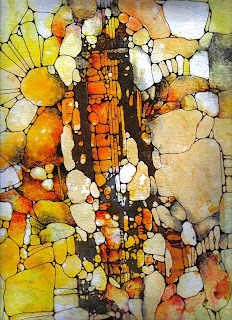 It is a combination of watercolor, ink, fluid acrylics and transfer done over tissue collage. workshops being taught at The Artist's Nook in Fort Collins, Colorado. Contact artwithmoxie@cox.net if you would like to be part of this on going workshop.